Eczema Herpeticum is a complication of Atopic Dermatitis. If not treated quickly or properly it can be potentially life threatening. Fortunately, fatalities are very rare. The condition tends to be diagnosed quickly and the treatment started straight away. The infection is caused by the Herpes Simplex virus. It is the same virus that causes cold sores. Everybody can get cold sores. Though children are more prone to them. As the virus is passed through contact, school is a major sharing ground. Cold sores mainly appear around the mouth and lips. They appear either singularly or in clusters. A herpes simplex infection, in healthy people, is pretty harmless. If you have eczema it can be a different story. Anyone can be affected by eczema herpeticum, though children tend to suffer more often. This is for the same reason that they are more prone to cold sores. They are more likely to have contact with other people who have the virus. The symptoms usually appear 5-10 days after contact. The condition is mainly found on the face. Though it can spread to other areas of the body. There may also be feelings of being generally unwell. You could feel like you have a fever, and perhaps nausea and tiredness. As soon as you suspect you have herpeticum you should visit your doctor. It is best for the treatment to be started as soon as possible. They are used because they fight the virus. They are taken as either tablets or liquid. A course is normally taken for 5 days. The course prescribed should always be completed. Completing the course helps to make sure that the virus has completely gone. It also reduces the likelihood of an immediate recurrence. When treating only use prescribed medications. Do not use the over the counter cold sore treatments, or any treatment used against the herpes simplex virus. Treatment should be started as early as possible. If it is left untreated it can be become serious. It can start affecting the body's organs. Including the lungs, brain and eyes. It could be life threatening. 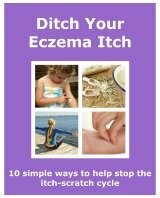 As with all types of eczema it is important not to scratch your skin. This causes skin damage, allowing the virus to spread easier. Because the herpes simplex virus is the same virus that causes cold sores it is important to try not to have contact with anyone who is suffering from cold sores. It is better to go for cold sore prevention rather than having to treat a herpes simplex infection. Prevention can be more tricky if your child has eczema and their school friend has a cold sore. You don’t want to segregate your child from their friends. It maybe worth talking to your child's teacher. Together you could come up with a solution that wont make your child and the child with a cold sore feel like there is something wrong with them. It is easier to deal with a relative is suffering with a cold sore. You can explain the complications of eczema herpeticum to them. When they understand the problems it could cause I am sure they will appreciate your worries.